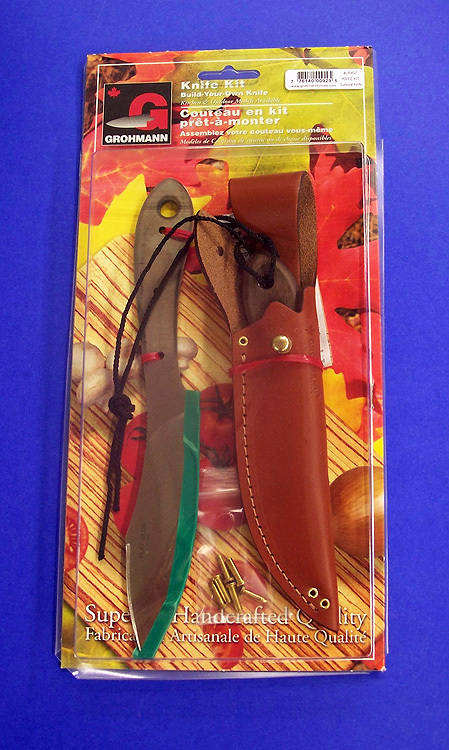 Outdoor Knives,Knife Kits,All (Outdoor Knives). Be a Knife Maker In your Own Home! The You-Make-It knife kits provide all the materials you need to make your very own outdoor knife right at home. Grohmann has supplied many groups such as The Boy Scouts of America with the #UR2S Trout & Bird kit at various Jamborees for decades. All kit parts are prepared and left unassembled. This gives you the joy of creating your very own knife with the added ability of customizing it for that personal touch. Since the knife will not be completed at the factory, no warranty or brand name is on this item and is final sale only. Besides having a fun project, you also save 25% off the finished knife price when you buy your knife as a kit! Each kit comes with all the materials you need, plus instructions and sharpening tips for future information (knife blade has already been sharpened and is ready for use). The blade's cutting edge is covered for protection during assembly. The covering is not be removed until the knife is completely finished and ready to be put in its hand-crafted leather belt sheath. The You-Make-It Knife Kits are available in most of our models with stainless steel blades and rosewood handles.